Ammon’s fiber optic utility is opening up competition for residents and businesses in the Idaho community of about 15,000 people. Their software defined network (SDN) allows users on the network to increase efficiencies and explore all sorts of creative visions that require high-quality connectivity. 2. Developers working on next generation networking services, products or Internet of Things (IoT) hardware in need of cloud functionality, high bandwidth, low latency network connectivity and a community of willing Beta testers. THRIVE is designed to allow Ammon premises that are connected to the Fiber-to-the-Home (FTTH) network participate in projects so locals can contribute to research and development. In its press release, the city described research on aging and “smart” smoke detectors in its press release. The project will allow researchers and developer from all over the world to access Ammon’s network for collaborative projects. The Utah Telecommunications Open Infrastructure Agency’s (UTOPIA) regional fiber network serves communities in the north central region of the state. Without the publicly owned network, it’s doubtful the eleven communities served would have access to high-quality Internet access. It’s almost certain they wouldn’t be able to choose between so many providers who operate on UTOPIA's open access infrastructure. Now, the city of Bountiful, Utah, wants the network to extend its reach to their community. Recently, the city council voted to give UTOPIA a franchise agreement so the network but the city will not contribute financially to the deployment. According to the Standard Examiner, officials from the networks anticipate the first customers will be business subscribers who would help pay for the expansion. Bountiful isn’t alone - other communities have granted franchise agreements to UTOPIA. “If UTOPIA and its member cities find that providing services to customers in neighboring cities benefits their operation, then it could be a win-win for both UTOPIA and non-UTOPIA cities alike." The franchise agreements will allow UTOPIA to deploy in cities' rights-of-way in order to connect customers to the network. Last fall we spoke with Mayor Karen Cronin from Perry City, which already connects to the UTOPIA network. She described how competition from the open access network has improved local services, the economy, and the general quality of life. Roger Timmerman participated in the interview as well. Listen to the podcast here. The Cherry Capital of the World, Traverse City, Michigan, continues to weigh its options to improve high-speed Internet service. The city of 12,000 homes and businesses has the results of a feasibility study and is carefully eliminating options as they look for the one that best suits their needs. Local newspapers, the Traverse Ticker and the Record Eagle, have followed the planning process. In late 2015, the city utility Traverse City Light and Power (TCL&P) began developing ideas on how to bring better connectivity to residents and businesses. The possibilities ran the gamut from an open access network to a public private partnership (PPP), and different groups within the community advocated for each option. In February 2017, the community received the results of a feasibility study, which detailed two main options: operating the network as a city utility or leasing the network to a single private provider. Both options assume about two years for construction and an initial customer base of around 2,900 homes and businesses. The proposed prices are $25 per month for phone service, about $50 per month for 100 Megabits per second (Mbps) Internet access, and about $80 per month for a gigabit (1,000 Mbps) Internet access. Eugene was recently named a recipient for a Mozilla and National Science Foundation Gigabit Community Fund award. The funding will allow education and workforce development ideas that require next-generation technologies to take advantage of the “Emerald City’s” new gigabit infrastructure. Last summer, the City Council voted to make a downtown fiber-optic infrastructure pilot project eligible for Urban Renewal funds. The approval allowed the Eugene Water and Electric Board (EWEB) the ability to expand the project to bring Gigabit per second (1,000 Megabits) capacity to more businesses in the city's downtown. Based on the success of the pilot and the new funding source, the city solidified plans to take the publicly owned network even further last fall. The city has approved up to $3 million to expand the open access network and connect to approximately 120 downtown buildings. "More and more businesses and jobs depend on high-speed internet, just as much as they depend on other basic infrastructure," says Mel Damewood, EWEB's chief engineering and operations officer. "This innovative 'open-access' model of public ownership partnered with private ISPs offers service in a cost-competitive environment, and that helps to support our growing tech sector and a vibrant downtown." In 2008, the counties of Accomack and Northampton created the Eastern Shore of Virginia Broadband Authority (ESVBA) to serve local needs and boost economic development. NASA provided key funding to build the backbone of the regional network. Today, the ESVBA has already improved wireless services in several communities and is at work on a Fiber-to-the-Home (FTTH) test project. The space agency played a key role in bringing high-speed connectivity to rural communities on the Eastern Shore of Virginia. Wallops Flight Facility on Wallops Island, Virginia, employs 1,100 people, launches rockets, and features a visitor center. Government agencies, local schools, and healthcare institutions on the shore all needed reliable connectivity for their programs. The FTTH test project started last September in Harborton, Virginia, as part of the Town Broadband Initiative Project. The landscape is typical of rural Virginia with little density as houses and businesses spread out into the woods. They have recently signed up the first few customers; this small town on the eastern shore has about 100 homes. In 2008, the counties of Accomack and Northampton created the public, not for profit entity through the Virginia Wireless Service Authorities Act to solve a growing problem on the shore. The lack of connectivity was having a negative impact on local rural communities. The counties provided an initial sum of about $270,00 to ESVBA to plan the network. Folks in Ammon, Idaho, are now getting choice, speed, and affordability from their new municipal Fiber-to-the-Home (FTTH) network. Home owners are making the switch and waving "bye-bye" to the burdens of a broken market for the benefits of publicly owned infrastructure. Out of 369 homes in the first district, 239 have signed up to be connected to the open access network; 22 installations are complete. Installations are on hold until winter is over, but the city’s Technology Director Bruce Patterson expects to add more as people experience their neighbors’ fiber service. In order to connect to the network, homeowners pay for the cost of the installation themselves either with a $3,000 direct payment when the project is completed or through a special property assessment over a 20-year period. Property owners who don’t want to be connected aren’t obligated to pay. Residents or businesses connected to the network then choose an Internet Service Provider (ISP) from those offering services over the network infrastructure. The network’s technology makes switching providers a simple task that can be done online. Local officials in Columbia County, Georgia, wanted better public safety communications, synchronized traffic signals, and better connectivity for government facilities. They decided the best strategy was a publicly owned network and their decision is creating opportunities they hadn't anticipated. When he considers how the county expanded its fiber network to improve economic development, education, and public savings, Columbia County Broadband Utility (C3BU) Broadband Manager Lewis Foster still sounds a little surprised. After all, Columbia County planned on using the network for a limited purpose, but then they realized the diversity of the asset. "It was almost an afterthought," he says. Before the idea of a publicly owned network saw the light of day in Columbia County, local leaders contacted the incumbent providers to set up a dark fiber lease. To their dismay, incumbents AT&T, Comcast, and WOW, would not lease the county dark fiber. County officials approached incumbents in 2007 and 2008 hoping to secure a dark fiber lease. The large providers, however, said they either didn’t have any dark fiber to lease, they could offer lit services, or they would build a dark fiber network for the county to use. Incumbents demanded a model where the county would pay the construction costs but the infrastructure would be owned and operated by the incumbents – who would then charge the County for access to the network the county had paid for. Foster recalls that incumbents we’re most interested in charging premium rates for lit services. Columbia County officials wanted a better option and found a more fiscally responsible approach in simply owning the network. When we first learned of the Lookout Lane fiber-optic project in the Kitsap Public Utility District in Washington, we knew we wanted to learn more. Kitsap PUD General Manager Bob Hunter and Telecommunications Superintendent Paul Avis join us for episode 237 of the Community Broadband Bits podcast. KPUD has historically focused on water and wastewater services but they increasingly hear from residents and businesses that Internet access is a major priority. We talk about their approach and how neighborhoods are able to petition KPUD to build fiber to them. The first area to use this option had very poor Internet access from the incumbent telephone provider. The discussion covers a lot of interesting ground, from how it is financed to where the demand is heaviest, and why public utility districts should have the option of using a retail model in some areas rather than continuing to be limited solely to wholesale-only by state law. For related information, consider our coverage of the Northwest Open Access Network. This show is 33 minutes long and can be played below on this page or via iTunes or via the tool of your choice using this feed. A new year promises a fresh slate for many people. For the folks at Washington’s NoaNet, it means starting out 2017 bond-free. In his year-end message, Chief Executive Officer Greg L. Marney announced that the organization has paid off its start up debt. At the November Board of Directors meeting, Controller Paul Harding reported that revenues are positive and that, “Budget to actual figures are favorable, with revenues above Budget and expenses a little below Budget.” Things are looking good at NoaNet. NoaNet has become a solid presence in the state of Washington. In 2000, Northwest Open Access Network (NoaNet) began connecting 170 communities across the state with approximately 2,000 fiber miles. The middle mile network provides connectivity in both urban and rural areas to schools, libraries, hospitals, and other government facilities. Sixty-one Internet Service Providers (ISPs) offer retail services vis the open access infrastructure. Recently, Anacortes and NoaNet decided to work together as the small community addresses its local connectivity problems. Last year, we put together a list of 15 NoaNet accomplishments, but you can also listen to Chief Operating Officer Dave Spencer visit with Christopher for episodes #164 and #159. Congrats to NoaNet! 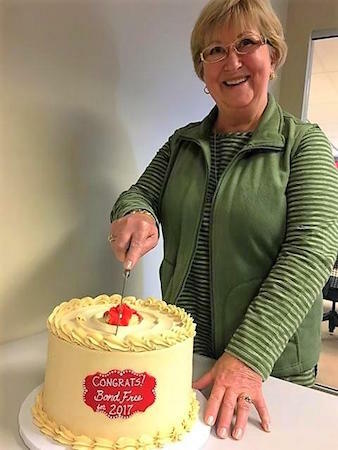 Linda Gott, President of the NoaNet Board of Directors, cuts a cake to celebrate the payoff of NoaNet's startup bonds this year.